The DreamWorks Movie Trolls is about how two Trolls Poppy, Princess of the Trolls and Branch, a loner survivalist try to save their village from the giant Troll eating Bergens. This fun set features all of the popular Troll characters including Princess Poppy, pessimistic Branch, Satin and Chenille-best Fashionable Friends Forever, DJ Suki, Biggie holding his favorite pet Mr. Dinkles, Guy Diamond, Fuzzbert and Cooper the tall 4 legged Troll! These nicely detailed figures are made out of hard plastic for many hours of fun play time and each comes on a nice stand so you can display them almost anywhere. 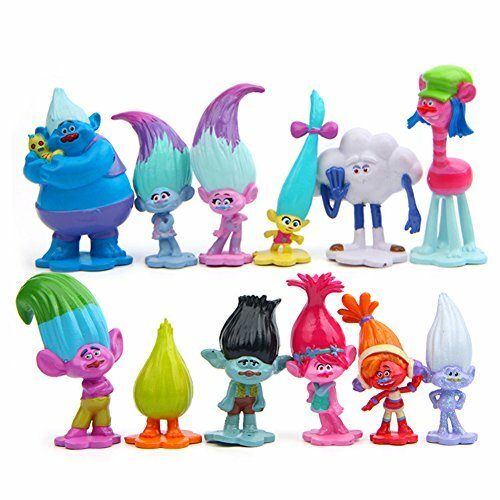 This fun set trolls toys including 12 Trolls figures,each toys comes on a steady stand so you can display them almost anywhere. The hard PVC trolls figures cake toppers are 1.5 to 2.5 inches tall that work best on 12 inch cakes or regular sized cup cakes. This set dreamworks trolls toys comes with all of the popular Trolls characters like Princess Poppy, pessimistic Branch, Satin and Chenille-best Fashionable Friends Forever, DJ Suki, Biggie holding his favorite pet Mr. Dinkles, Guy Diamond, Fuzzbert and Cooper the tall 4 legged Troll! Not only for cake toppers, They are good for children 4 and older and make a neat gift idea! And are great for any Troll fan! Package: 12pcs mini trolls into a clear polybag. It is ready for sending as gift for boys and girls. Weight: around 180g. If you have any questions about this product by Evursua, contact us by completing and submitting the form below. If you are looking for a specif part number, please include it with your message.